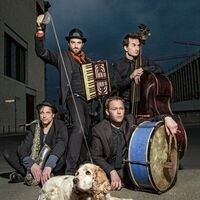 Daniel Kahn & the Painted Bird is a German-based klezmer band founded by Kahn in 2005. Described as “an absolute must for lovers of unusual, intelligent, challenging, exciting folk music and a blast at every instant,” the band will perform a free concert featuring songs in Yiddish this November 2018 on the CU Boulder campus, as part of the Program in Jewish Studies Community Talks Series, Yiddishkvell: An Appreciation of All Things Yiddish. A Detroit area native, Kahn attended the University of Michigan where he studied acting, directing, playwriting and poetry. After finishing his studies he lived, played music, recorded, acted, directed plays and composed theater music in New Orleans, Detroit, New York and Ann Arbor. He has received awards for his playwriting, poetry, acting and composing. Learn more on the band's website. Daniel Kahn & the Painted Bird's visit is hosted by the Program in Jewish Studies and is part of the Community Talks Series, made possible in part by a grant from Rose Community Foundation. Community Talks features nationally and internationally renowned scholars, authors, artists, and performers for themed public events with the goal of enriching community learning and expanding access to academic programming on Jewish culture and history.